Roughly 200 people rallied against the looming $3.2 million cut and a skyrocketing $31 million pension payment Thursday. In that crowd stood Irene Encarnación, who was fighting to keep a job she’s held for 27 years. An NKU world language and literature professor, Encarnación told the crowd that she and 77 other faculty in arts & sciences, informatics and education received letters of potential non-reappointment on March 30. 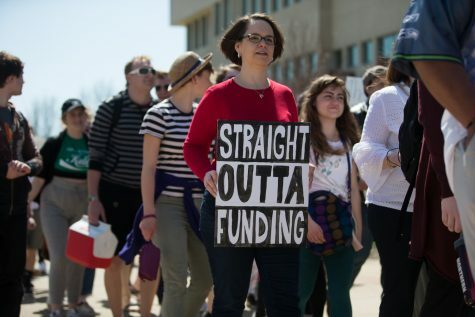 Irene Encarnación, a world languages professor, told ralliers outside the Student Union that state cuts and pension costs unfairly punish faculty. “Let’s do the math: 78 instructors that are already scheduled to teach nearly 630 courses during the next academic year— what is going to happen to these courses? What is going to happen to students who already registered for the courses in the fall?” she asked. 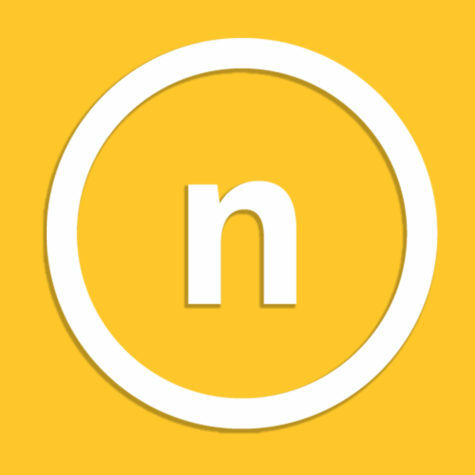 Encarnación wondered aloud if NKU would compromise its small, “up-close and personal” class sizes by cutting positions. The university’s current student-teacher ratio is 19:1, and 35 percent of classes host 20 students or less, according to U.S. News and World Report. A faculty senate member serving on the professional concerns committee, Encarnación said these cuts are undeserved, and faculty are being unfairly punished. Signs hung on the glass wall of the Student Union on April 12. “Since the moment that I received this letter, I’ve been told… that the 78 letters were a technicality, a precautionary method and only from three colleges,” Encarnación said. “I am going to ask you to make sure that these letters are indeed a technicality and a precautionary method because if there’s truth to this, then we’re really screwed. “NKU, what are we gonna do?” Encarnación asked. 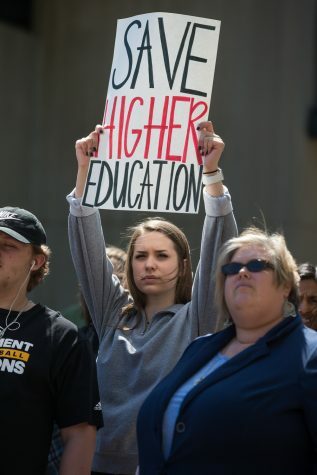 Governor Matt Bevin vetoed the Kentucky legislature’s budget bill Tuesday, which would have offset a $3.2 million cut to NKU with outcomes-based performance funding. Bevin signed pension bill SB 151, which does not affect NKU’s pension payment. 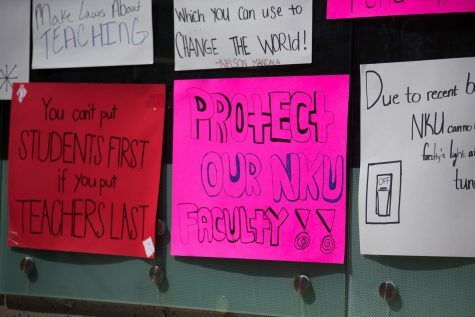 That payment plus rising fixed costs could mean a $20 million impact for NKU, according to interim president Gerard St. Amand in an email to faculty. Professor of geology Trent Garrison told the crowd that NKU is headed toward an uncertain future, but there are a few things that could happen. Governor Matt Bevin vetoed a budget bill which would have offset a cut to NKU with performance funding. Legislators could override Bevin’s veto. Out of the crop of bad scenarios, Garrison sees this as the best option. The legislature could also draft a new budget in the last days of the session, or, if there is no budget by June 30, the state government could shut down. Garrison asked students to keep calling their representatives, something he said is “ridiculously easy” and effective. 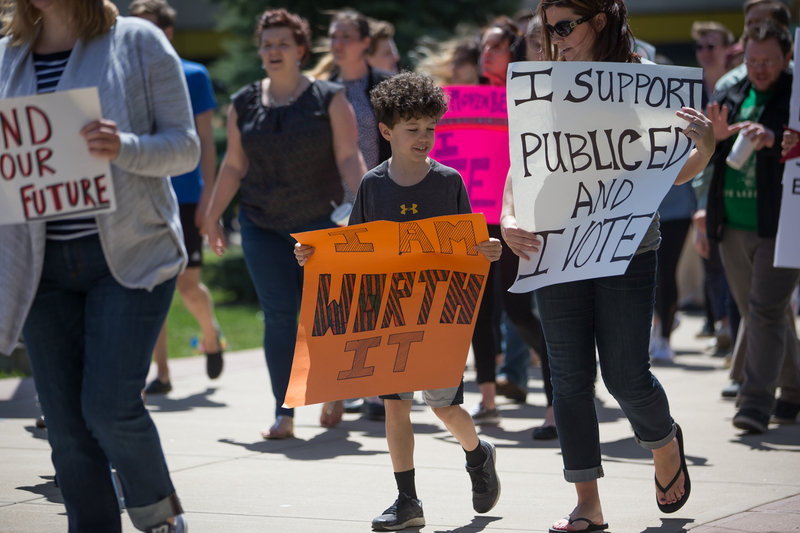 “We have to continue to do our research and support people who support public education, people who support raising enough revenue to support education,” Garrison said. “We can’t just do this patchwork thing. You can’t underfund and underfund and underfund and continue to expect results. 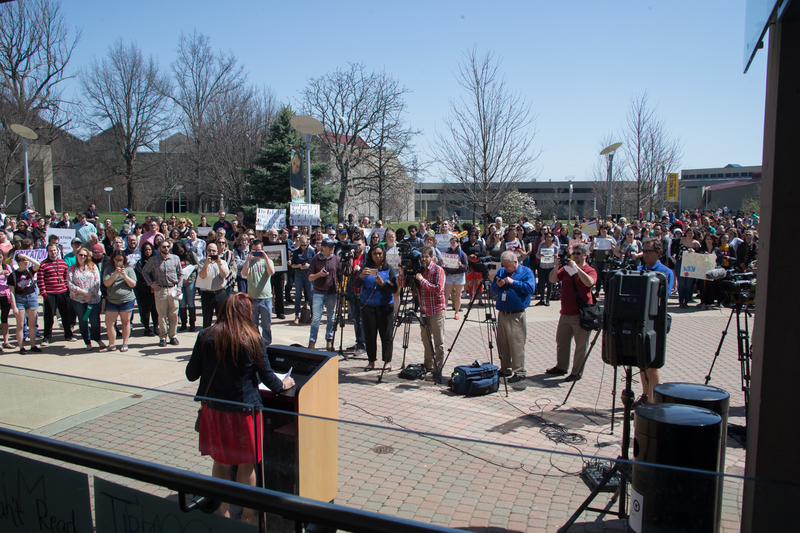 Roughly 200 people protested higher education cuts outside the Student Union on April 12. Associate professor of communication Mark Leeman told the crowd that making education a lower financial priority drives business and opportunity out of the region. He cited Cincinnati’s failed bid for Amazon’s new headquarters. Leeman also spoke to students about public higher education costs going up, warning that tuition hikes could mirror private universities. Students, professors, staff and others marched from the Student Union around campus to protest cuts. Leeman said such tuition hikes would price out poorer students in an age where a bachelor’s degree is necessary to get ahead. He compared student loans debt to a “mortgage” on education. “Education is not an expense on the budget. Education is an investment that pays back many, many times over,” Leeman said. 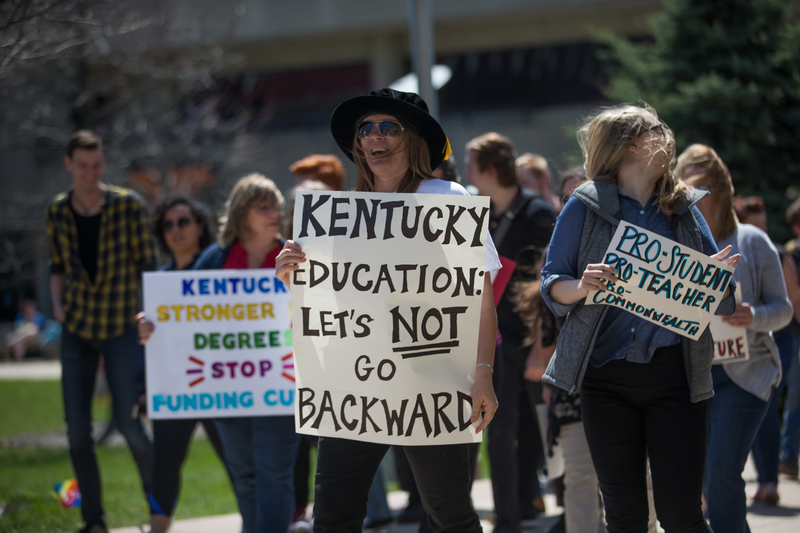 Other Kentucky schools are already hurting financially. Last week, Eastern Kentucky University’s Board of Regents voted to cut 153 positions, two sports teams, a regional campus and funds for programs including theatre, deaf studies and economics, according to EKU’s student newspaper The Eastern Progress. EKU faced a $25 million shortfall compared to the $20 million impact facing NKU. Amid cuts, Dr. Lex Pulos, an electronic media and broadcasting professor, lamented what NKU could do for its students if programs were fully funded. “We could do a lot if we got full funding,” Pulos said. “There are so many things we would want to do if we were able to fully fund all educators in all departments. Are programs bracing for impact? Rebecca Hansen, who works in the Office of International Students and Scholar Services, said she has felt the budget tighten around her program long before this year’s challenges. 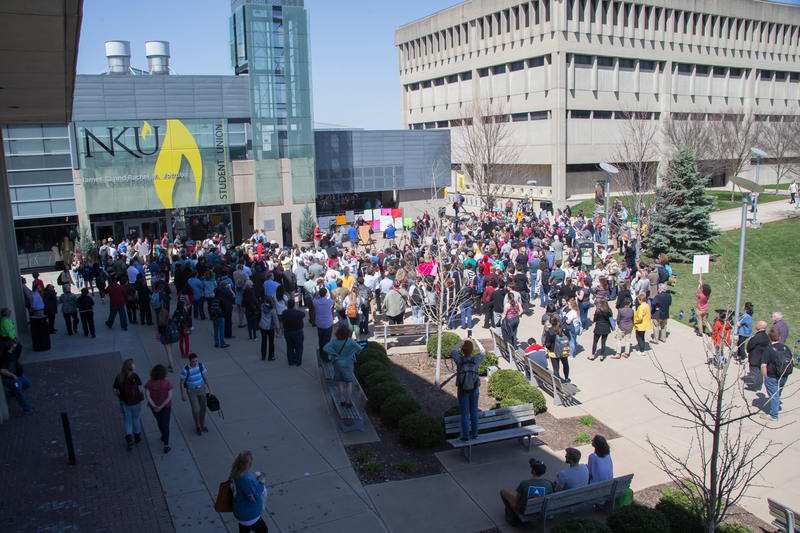 Hansen said if those immigration services are lost, NKU could lose the ability to host a diverse international student population. Over 70 faculty in arts & sciences, informatics, and education received letters of possible non-reappointment on March 30. Retirement is a particular point of frustration for Tiffany Budd, budget officer for NKU’s Center for Global Engagement and International Affairs. NKU payments to the Kentucky Employee Retirement System (KERS) are set to rise by $13 million while benefits for 700 pensioned staff haven’t changed. “It’s ridiculous when we’re not the ones who have caused the problem and yet we are the ones suffering for it now,” Budd said. 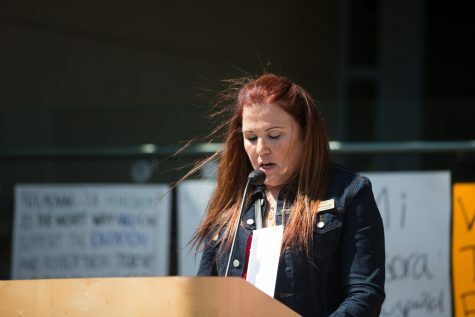 As far as her program’s future, Budd said she is as uncertain as any other NKU staff member. Theatre majors Nick Palazzolo and Jared Gruber said they are worried about letters notifying faculty their positions may not exist in fall. The pair said they know of five faculty who received letters. “78 potential job losses, that’s 78 families that are losing a source of income, not to mention all of the people that will lose out on an educational opportunity because of these cuts,” Gruber said. Palazzolo said the recent cuts to EKU’s staff and programs, specifically theatre, is troubling as a student in the same field. Vanessa Leahr and Maddi Johnson just started studying theatre at NKU, and worry money for the program might be slashed. “It’s absolutely insane that I spent 12 years of education, finally decide on a major and find out it might be sacrificed after one year of being here,” Johnson said.